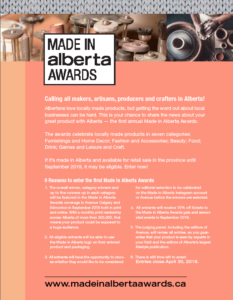 Calling all makers, artisans, producers and crafters in Alberta! 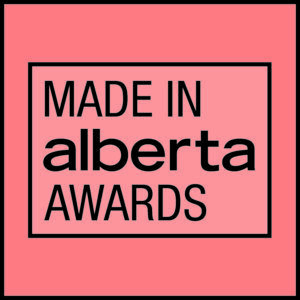 great product with Alberta — the first annual Made in Alberta Awards. Furnishings and Home Decor; Fashion and Accessories; Beauty; Food; Drink; Games and Leisure and Craft. If it’s made in Alberta and available for retail sale in the province until September 2019, it may be eligible. Enter now! 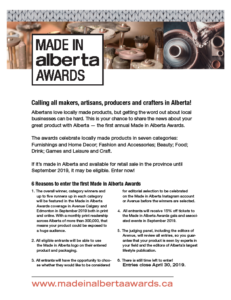 The overall winner, category winners and up to five runners up in each category will be featured in the Made in Alberta Awards coverage in Avenue Calgary and Edmonton in September 2019 both in print and online. With a monthly print readership across Alberta of more than 300,000, that means your product could be exposed to a huge audience. 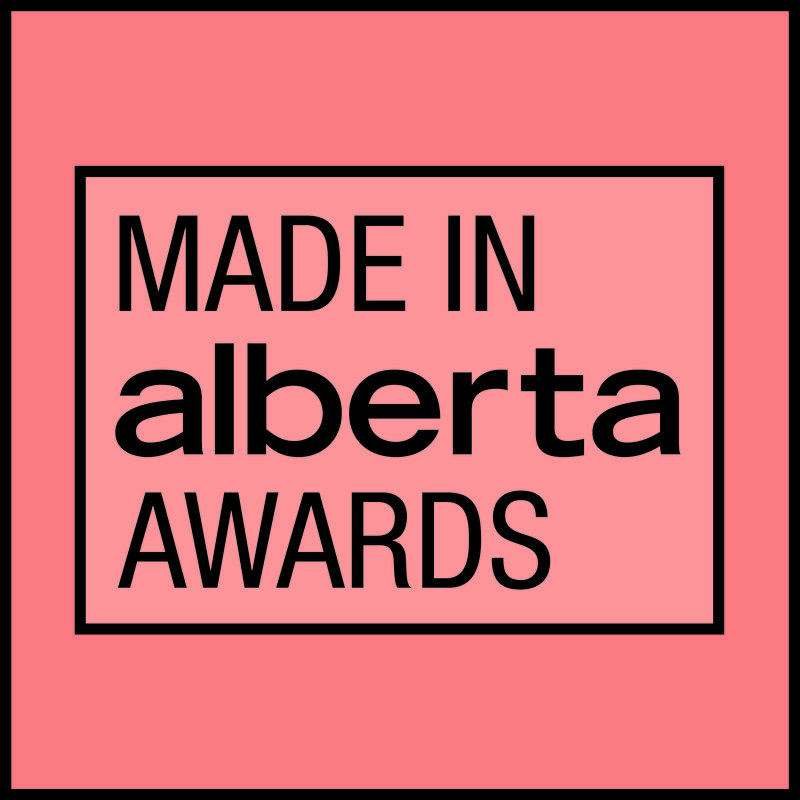 All eligible entrants will be able to use the Made in Alberta logo on their entered product and packaging. All entrants will have the opportunity to choo-se whether they would like to be considered for editorial selection to be celebrated on the Made in Alberta Instagram account or Avenue before the winners are selected. All entrants will receive 15% off tickets to the Made in Alberta Awards gala and associated events in September 2019. The judging panel, including the editors of Avenue, will review all entries, so you guarantee that your product is seen by experts in your field and the editors of Alberta’s largest lifestyle publication. There is still time left to enter! Entries close April 30, 2019.